I know many of you have already launched into full on Holiday mode, but I’m savoring these last few weeks of oranges and reds. This Autumn eye makeup look is bold enough for evening wear, but soft enough for day wear too. Follow my step-by-step tutorial and re-create this easy Autumn eye makeup look on yourself. BTW, this is a great makeup option for celebrating Thanksgiving! 1.) Start by filling in your eyebrows. 2.) Brush a shimmery, light beige eyeshadow from your eyelids to your brow bone. 3.) Swipe a mauve-y red eyeshadow onto your eyelids. 4.) Fill in your crease with a light brown color or a gray-lavender, something earthy. 6.) Line your top lash line with a liquid black eyeliner and create a small wing. 7.) Line the inner corners of your lower lash line with white eyeliner. 8,) Line the outer corners of your lower lash line with black eyeliner. 9.) Brush a lengthening mascara to your upper lash line and along the outer corners of your lower lash line. VoilÃ ! Your Autumn eye makeup look is complete. I used all products listed below to create this look, except for the Lime Crime Venus Palette. I used the Moschino x Sephora Shopping Bag Eyeshadow Palette, but since it is no longer available for purchase, I recommend using the Lime Crime Venus Palette in its place. Anastasia Beverly Hills Brow Wiz Mechanical Brow Pencil – Click here for more info. 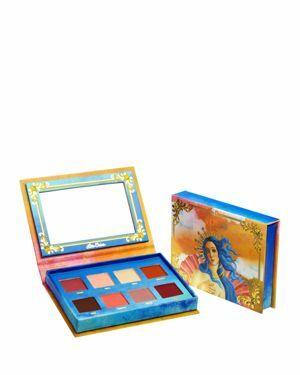 Lime Crime Venus Eyeshadow PaletteÂ – Click here for more info. theBalm Schwing Liquid EyelinerÂ – Click here for more info. Pixi Endless Silky Eye PenÂ – Click here for more info. LORAC PRO Front of the Line Waterproof EyelinerÂ – Click here for more info. theBalm Mad Lash Black MascaraÂ – Click here for more info. ALL products used to create this easy Autumn eye makeup look are Cruelty Free! Gorgeous- I have to duplicate! Thank you! This look would look gorgeous on you!